Through collecting items for the Grecian Archive, and by showing them to people at the club and out in the community, one of the unexpected things that has seemed to stand out and resonate with people is anything to do with advertising and sponsorship. People view the adverts in programmes from across the years and often recall stories related to their experience and memories of the business in question. 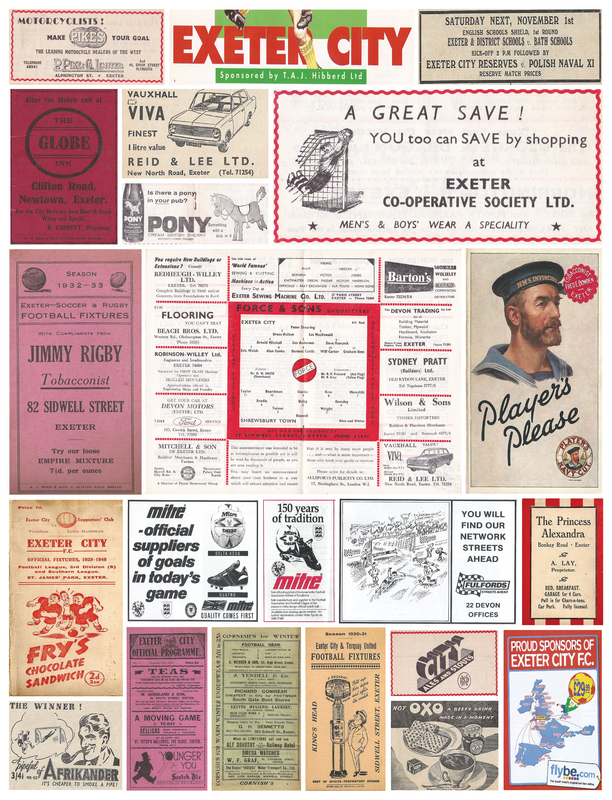 Over the course of the History of St James Park project we have been sent hundreds of images and programmes, so he we show a handful of them whilst looking briefly at the types of advertising and sponsorship used in football and at Exeter City. At the centre of almost all the programmes is image that is indicative of the nature of advertising all the way through the clubs history. From the very earliest programmes, of which surviving ones date back to the 1910s, and until the 1970s, each and every match day programme features the team lineup in the middle of the centre page, surrounded by various adverts. In many ways, these programme features are a representation of the club and its relation to the city. At the heart of the page is the team, set up to go at St James Park in front of the fans, while around the outside the adverts show the shops and businesses outside of St James Park. Looking at these programmes through the years provides a perfect opportunity to chart not just those who have supported and associated themselves with the club, but also how the landscape of the city and its economy has changed. One notable example is the number of Sidwell Street pubs that appear in the pre-war programme, allowing us to map some of those businesses that were lost in the Second World War. In other changes, the early programmes have manufacturers, such as clothing merchants and butchers, dominating the pages, and as the years progress new merchandise begins to make an appearance in the form of sportswear companies and motor companies, to name just a couple of notable growing additions to the local economy. Local producers also find themselves alongside national retailers such as the Edinburgh Brewers the Younger Team and their slogan For ‘Vim and Vigour in work and play, see you get younger every day’, which was a staple of the programme for much of the 1940s and 1950s. Today alcohol still features in the advertising and sponsorship arena, but one thing that is no longer seen, particularly in football, are cigarettes. However, this was a staple feature for nearly 100 years. One of the earliest forms of the commercialisation of football was the production of cigarette cards featuring footballer players. In England, images began to appear on cigarette cards from 1894, with the first set featuring footballers was produced by Manchester-based Marcus & Company in 1896, and in the archive we have collected a number of these items showing players such as Bob Watson, the clubs first professional captain. The popularity of these cards grew in the early 1900s, and reached its peak in the 1920s. Tobacco companies encouraged the collection of cigarette cards by producing collection albums, with the aim of promoting brand loyalty, which increased their popularity. This is a very early example of the commercial side of football, but one that declined during and after the Second World War due to paper shortages it caused. Following the war the boom in production led to more products and more adverts. The programmes got bigger, but also new more imaginative ways of advertising had an impact on the park, not least on the Old Grandstand where the slogan ‘Team up with REGENT for better results’ was emblazoned on the roof. Around the ground advertising hoardings have been commonplace from the very beginning, once again charting the popular items of the local and national economy. Our redevelopments panel shows an image of the away end in both the 1920s and the 2010s, where in one, Frys Chocolate, Bovril, and Swan Vesta’s, can be compared in the other to Capital Taxis and Flybe, the aviation company. Today, as the sport develops its popularity, sponsorship can be found all around the ground at St James Park. It was often the practice in football to name stands after significant people of a club, yet the popularity of the game and increased needs for funds have led to utilizing spaces for commerce. The Duke Bank or the Cliff Bastin Stand, and the Ivor Doble Grandstand, are all features that would be familiar with older fans, whereas new fans would see that the Main Stand is sponsored by IP Office Ltd, Thatchers sponsor the Big Bank Stand, and the Old Grandstand is officially known as the Stagecoach Family Stand. Other club partners include Paramount, EDF Energy, St Austell Brewery, and RGB Building supplies, all of who are valued partners in developing our modern football club. Perhaps the most recognizable form of sponsorship in football is now a firmly established aspect of the kit sponsor. However, it is quite a recent development. In English football, shirt sponsorship only began in the late 1970s, although it was already common abroad – Jägermeister had appeared on German team Eintracht Braunschweig’s shirts since 1973. The first English club to adopt shirt sponsorship was Kettering Town, who debuted their kit featuring the logo of local company Kettering Tyres in a Southern League Premier Division match against Bath City on 24 January 1976. Opposition from the Football Association meant the logo was soon dropped, but in the next season, with the support of Derby County and Bolton Wanderers, Kettering Town successfully convinced the FA to allow shirt sponsorship. 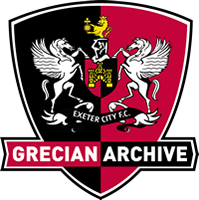 Shirt sponsorship was adopted by Exeter City in 1984 when LCD Advertising appeared on the club’s shirts. Their next shirt sponsor was Facer Books (1988-1989), followed by local electrical engineering company T.A.J. Hibberd (1989-1992). For the 1992-1993 season Carling appeared on Exeter’s shirts, before local company, ALC Windows, who remained as shirt sponsors through to 1997, replaced them the next season. Sponsors between 1997 and 2001 included Concept Incorporated and Exeter Healthcare, and from 2001 the builders’ merchants Jewson appeared on the Grecians’ shirts. In 2003 they were replaced by Flybe, who had just become Exeter’s main sponsor and are still the club’s shirt sponsors, and who, having appeared on the kit for 14 years are one of the most long standing sponsors in the football league. In all, the items mentioned in this article are just a few examples of advertising and sponsorship over the years at Exeter City, but there are hundreds if not thousands more that have associated themselves with the club over the years. However from a heritage point of view any one of them can have value, as triggers that remind us of different eras in not only the club’s past but also the history of the City and our culture.